The ocellated lizard is a beautiful creature. When it's young it's brown with white dots, but as it gets older its scales become black and green. Individual scales continue to switch colour, until the simple polka dot pattern turns into an intricate black-and-green labyrinth. It's an amazing transition — but how does the lizard do it? The answer seems to come from some relatively straight-forward maths. The lizard's scales are roughly hexagonal, so imagine a honeycomb pattern in which each individual hexagon is either black or green. Now imagine that periodically each hexagon looks at its six neighbours and changes its colour depending on what the colours of these neighbours are. For example, in the pictures below each hexagon changes its colour if four or more of its neighbours are not of its own colour. As time goes by, scales keep switching colours and new patterns evolve. In our example, which shows three time steps, small islands of one colour surrounded by the other colour gradually disappear, until only bands of colours remain. This kind of set-up — a pattern in which cells update their colour at each time step depending on the colour of their neighbours at a previous time step — is called a cellular automaton. Mathematicians and computer scientists have enjoyed playing with cellular automata since the 1940s, creating all kinds of weird and wonderful examples. Because cellular automata are good at creating patterns, they've also been used to simulate processes that happen in nature (see, for example, this article), but so far nobody has found a biological system that actually is a cellular automaton. 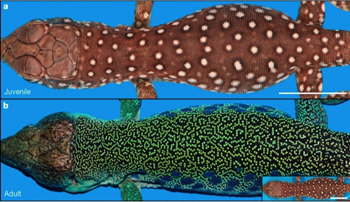 It seems like the ocellated lizard might provide the first example. In a recent study a team of mathematicians and geneticists (including the Fields medallist Stanislav Smirnov) watched three male lizards as they grew from little hatchlings into three to four-year-old adults. Carefully counting lizard spots, the team tried to find out whether a scale flipping colour at a particular time depends on the colours of its direct neighbours at a previous time step. 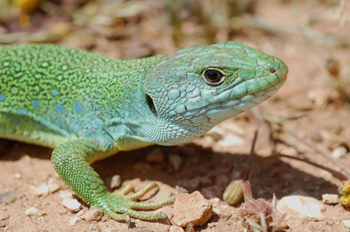 Their work strongly suggests that it does, which means that the lizard's scales do indeed behave like a cellular automaton, albeit with a difference to our example above: scales aren't sure to change colour as soon as their neighbours display a certain colour configuration. Instead, they change colour with a certain probability, which depends on the neighbouring colours: the more neighbours of a scale have the same colour as the original scale, the more likely the original scale is to change colour (note that that's the opposite behaviour to our example above). 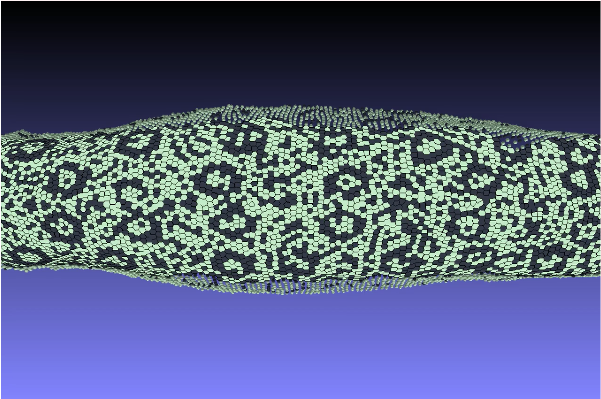 The lizard's scales seem to form what's called a probabilistic cellular automaton. The first video below shoes the evolution of the scales on a real lizard's back and the bottom shows the cellular automaton. You can see the similarity. The team didn't just rely on videos though, but used several mathematical checks to make sure their conclusions are justified. But how do the scales do that? After all, individual skin cells don't know what scale they're part of, they don't have binoculars to see what colour a neighbouring scale is, or a mind to decide whether to switch colour or not. This is where it gets really interesting. In the 1950s the famous mathematician and code breaker Alan Turing came up with a model for how animal patterning might arise that doesn't involve skin cells having to "know" anything. The general idea is that an animal's skin contains two chemicals, which diffuse through the skin, just like milk poured into coffee will diffuse, and also interact with each other. Using a set of equations Turing described how the concentrations of the two chemicals very over the animal's skin and over time. He found that, if the chemicals are also linked to the production of pigments in the skin, their behaviour can give rise to the spots and stripes we commonly see on animals (see here for a detailed explanation of Turing's model). A crucial feature of Turing's model, and other models inspired by his work, is that it's continuous: the concentrations of the chemicals change gradually, rather than suddenly, over time and the skin of the animal. At first sight, this couldn't be more different from the lizard-inspired cellular automaton, in which individual scales flip colour instantaneously and have sharply defined edges. A cellular automaton is a discrete object. Is this at odds with Turing's well-known theory? The answer is no. The new study shows that if you take into account the varying thickness of the individual scales, that is, you treat the skin as a 3D object rather than a 2D surface, then the continuous equations start to "notice" the boundaries between different scales and behave in a particular way. Mathematical analyses show that a single skin scale can rapidly take on a uniform colour, which can quickly turn into one of two extremes (green or black). These extremes depend on the states of neighbour scales. Thus, the continuous model naturally gives rise to a discrete cellular automaton. This is also what makes the lizard cellular automaton unique. Usually, cellular automata are used to simulate pattern formation. The space on which the patterns form (say an animal skin) is imagined to be made up of many tiny pixels (just like a computer screen), and the cellular automation uses these pixels as its cells. Because these cells are very small compared to the features of the patterns that emerge, the patterns look nice and continuous, rather than pixelated. In this case, a continuous reality is simulated by a discrete system. In the ocellated lizard's case, however, things are fundamentally different. The cellular automaton arises from a continuous system, described by Turing's equations. 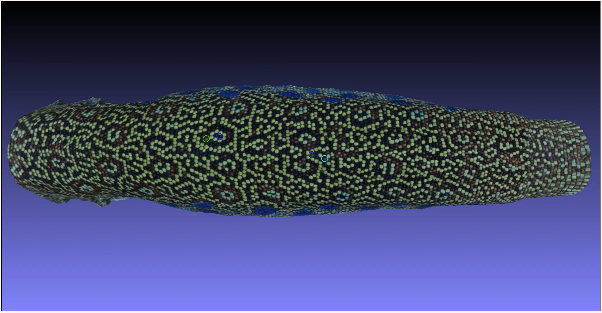 It's not a simulation tool and its cells aren't microscopic, but clearly visible and of a size comparable to the features of the pattern. This, so the team behind the study argue, provides evidence that cellular automata aren't just computational tools, but can exist in living things.